For many C# applications a pseudo-random number generator is more than enough. The advantage being that numbers are generated quickly. However for C# random applications that deal with things like lottery or very secure encryption, generating truly random numbers is important. That is where the true number generator comes in. Truly random numbers are created by observing physical phenomenas and feeding the data into a computer. The numbers generated are completely random. Making your C# random applications download data from random.org is extremely simple. It is just like downloading any other webpage, which we talked about in the HTTP data download article. So you need to supply at most three parameters: the minimum value, the maximum value (inclusive as opposed to the .Net Random class), and the amount of trials. 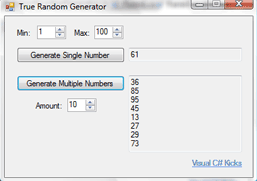 The final C# random generator source code is really simple to use. Unlike the .NET Random class, our RandomNumberGenerator class does not need to be initiated and is still perfectly thread-safe.